Canada’s lead Arctic and Offshore Patrol Ship (Arctic and Offshore Patrol Ship (AOPS)), the future HMCS Harry DeWolf, was launched on 15 September 2018, marking a significant milestone in Canada’s National Shipbuilding Strategy (NSS) and the revitalisation of the Royal Canadian Navy’s fleet and its ability to operate in the Arctic. 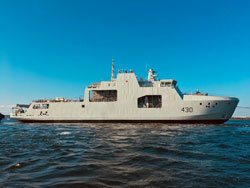 At 103m, the future HMCS Harry DeWolf is the largest Royal Canadian Navy ship built in Canada in 50 years. The ship was transitioned from Irving Shipbuilding’s land-based facility to a submersible barge on 14 September and was launched the following day. The lead ship in the AOPS programme is now pier-side at Halifax Shipyard where it will be prepared for sea trials in 2019. HMCS Harry DeWolf is scheduled to be turned over to the Royal Canadian Navy in summer 2019. Construction of the second and third ships, the future HMCS Margaret Brooke and Max Bernays, is well underway at Halifax Shipyard with the first two major sections of the future HMCS Margaret Brooke due to have been moved outside in September. The National Shipbuilding Strategy was created to replace the current surface fleets of the Royal Canadian Navy and the Canadian Coast Guard. Through a competitive, open and transparent process, Irving Shipbuilding was selected to construct the Royal Canadian Navy’s future combatant fleet, including the AOPS vessels and the new Canadian Surface Combatants. The bow section of the future HMCS Harry DeWolf was transported on heavy-lift transporters from inside Halifax Shipyard’s indoor shipbuilding facility outside to land level in December 2017. Work continued over several weeks to fully join the bow mega-block and its components to the centre and stern mega-blocks, which were transported to land level in July 2017. The DELMS contract was awarded to BMT Fleet Technology and STX Canada Marine, who developed and tested (simulation) a preliminary design. Under the National Shipbuilding Procurement Strategy, the AOPS contract was awarded to Irving Shipbuilding in 2011 as part of a combatant vessel work package, with the ships to be built at Irving’s Halifax Shipyard. The DELMS contract was followed by a C$9.3 million (US$7.1 million) follow-on design contract to Irving’s Halifax Shipyard in July 2012. Then, in March 2013, a further definition contract of C$288 million was awarded to Irving that among other things would take the AOPS design to the point that construction could start in September 2015. As part of this contract, the creation of the detailed plans was outsourced to a firm in Denmark. The project is intended to deliver vessels capable of conducting armed seaborne surveillance of Canada’s waters, including the Arctic; providing government situational awareness of activities and events in these regions; and cooperating with other elements of the Canadian armed forces and other federal government departments to assert and enforce Canadian sovereignty, when and where necessary. The AOPS will have a number of capabilities that will allow the ships to assist the Royal Canadian Navy in carrying out missions but will be lightly armed. The vessels will be capable of performing independent open ocean patrols on the east and west Arctic during the navigable season and has been designed to a Polar Class 5 international ice classification standard which will allow for operations in first-year ice up to 1m in thickness. AOPS vessels will have the capability to manoeuvre in ice, however they will not provide icebreaking services to other vessels. They will be able to sustain operations for up to four months and have a range of at least 6,800nm at 14knots with sufficient command, control and communication capability to exchange real-time information with the Canadian armed forces maritime security operations centres. The new vessels will have a cruising speed of at least 14knots and a maximum speed of at least 17knots, gun armament and are intended to remain operational for 25 years beyond initial operational capability. They are also designed to be capable of embarking and operating a variety of helicopter types up to and including the Royal Canadian Air Force’s Cyclone helicopter and be capable of embarking and deploying a variety of boat types to support activities such as boarding operations and transfer of cargo and personnel for ship-to-shore transfer as well as arrangements for cargo and container storage to support Canadian armed forces and other government departments operations. Speaking before the Commons National Defence Committee on 18 November 2014, then Commander of the Royal Canadian Navy, Admiral Mark Norman, said the vessels would not be used tactically, to defend Canada. “We see the Arctic as hugely important,” he said. “The Arctic represents a fundamentally maritime operating environment. It is defined by the ocean; therefore, we see it as a key area for us to be looking forward to operating in over the years and decades ahead. “The Arctic offshore patrol ships will play a key role in enabling the Royal Canadian Navy, with its other government partners, in opening up our ability to operate and sustain operations in the High Arctic. “As we move into the Arctic… it is not just physical capability in terms of ships… the Arctic offshore patrol ships, the Harry DeWolf vessels, are going to give us a significant improvement in the ability and the overall Government of Canada’s capacity to have a sustained presence in the north. “AOPS is not being built or delivered to deal with the Russians. AOPS is being built to deal with our northern waters. Irrespective of any relationship we may have with partners in the Arctic Council, which includes Russia, or with anybody we may have disagreements with, including our neighbours with whom we occasionally have disagreements about territorial issues, the purpose of having a capability like AOPS is to have a naval presence in what is the largest maritime space in Canada. It is increasingly open to navigation.